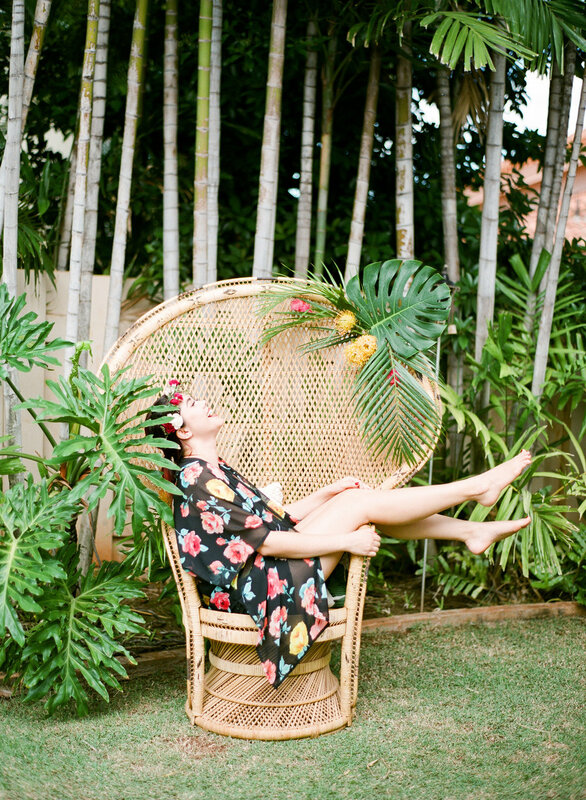 Located in the heart of Honolulu, Kaka’ako is the playground for every hipster. Although it may not seem like much at first, look a little closer and you’ll see an array of various murals along each building side amongst the warehouses. Every mural showcases each artist’s unique personality & inspires those who see it to create their own art. 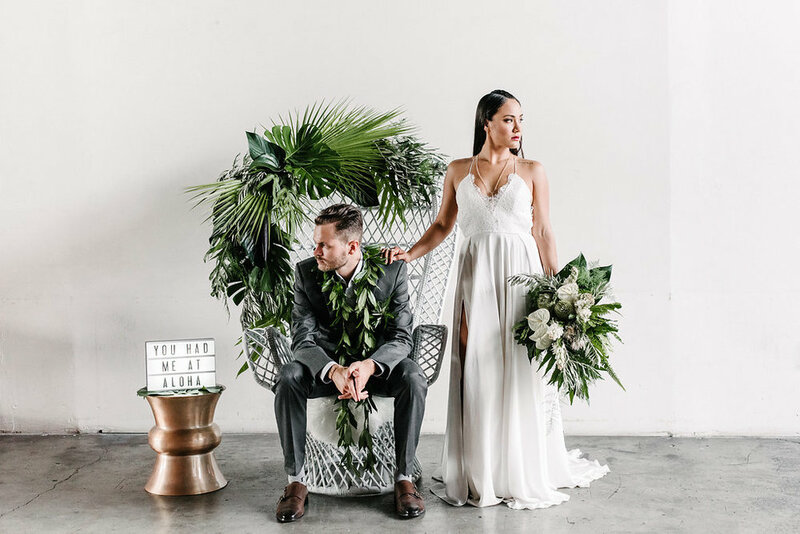 Given its modern aesthetic, it made the perfect landscape for a mid-century modern, bohemian photo shoot. 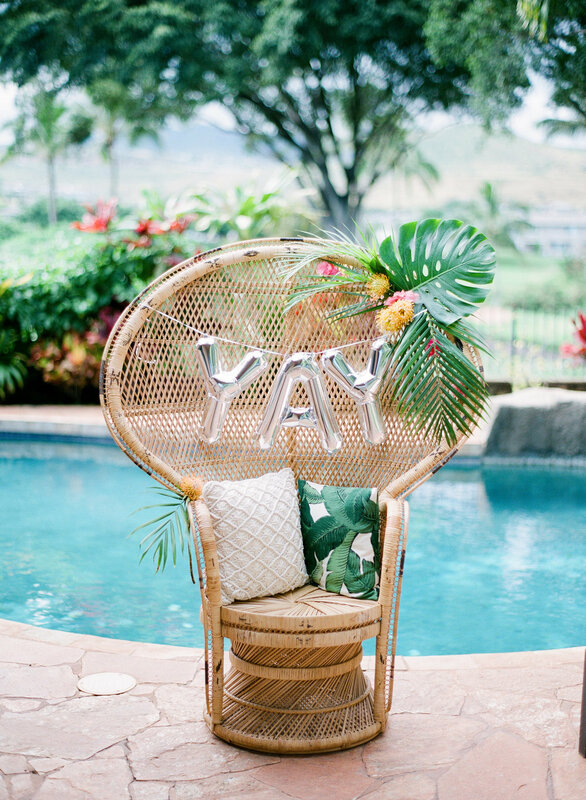 Together with photo magic of Gabriella Katalin, we were able show off our creative passion at the Kaka’ako Agora. 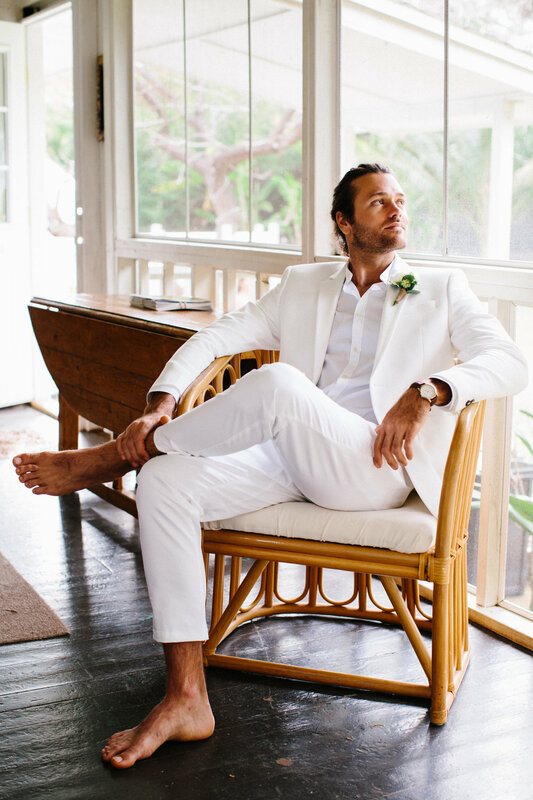 This lovely little video by Pono Grace captured all the magic of that day. Every photo Gabriella Katalin highlighted the strengths of everyone involved and their hard work. We’re grateful that Nouba’s’ blog took notice of this well and featured the entire thing here! 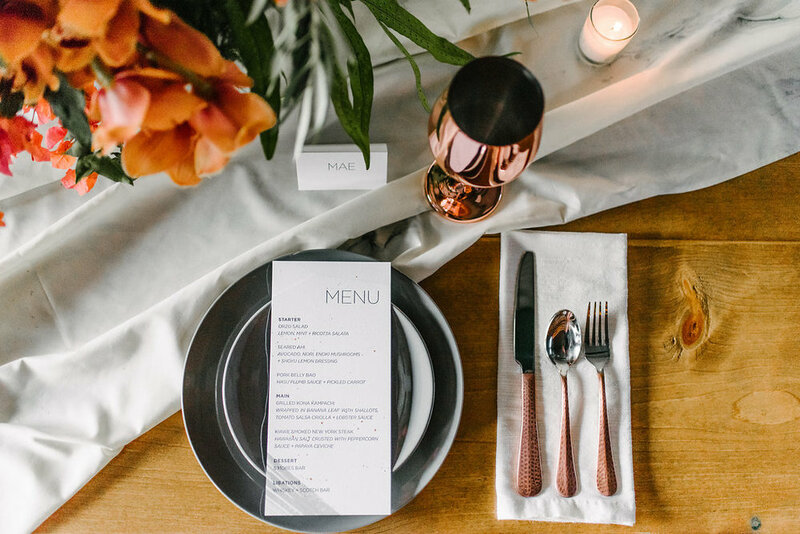 The kick-off to any amazing wedding are the invitations. 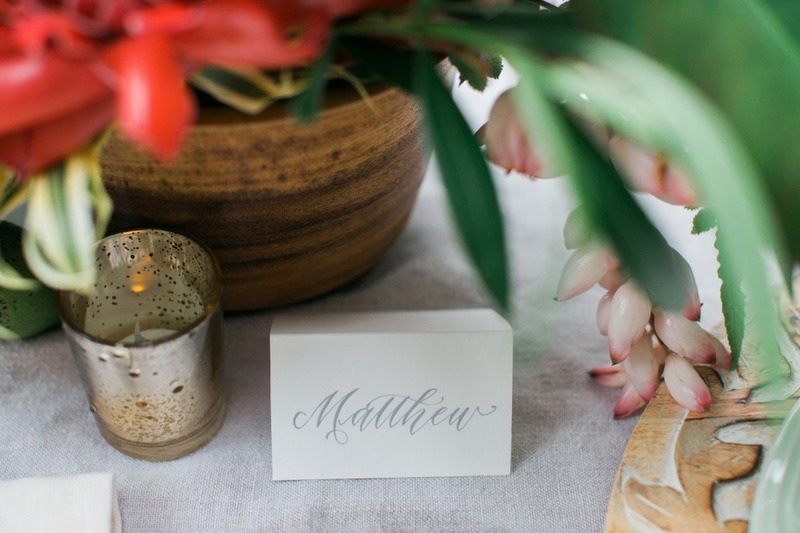 It sets the mood for your wedding before it even starts and gets guests excited for the big day ahead. 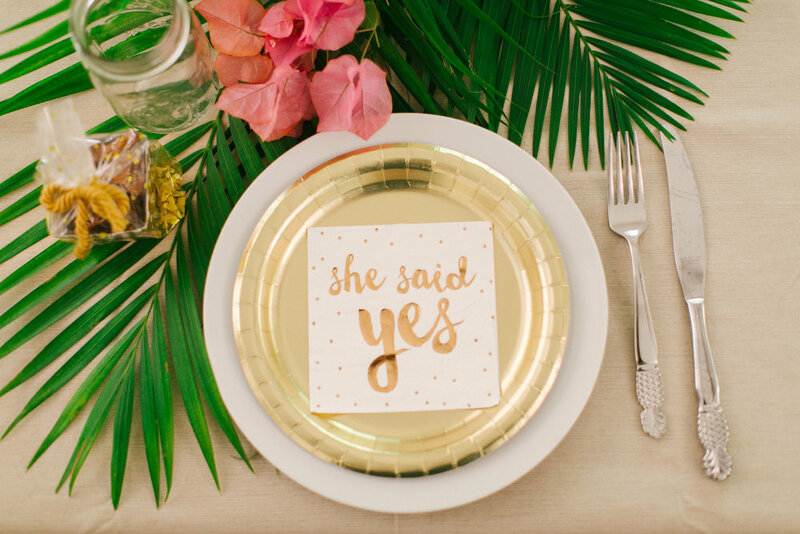 JiwaJiwa Press created the perfect invitations to do just that. 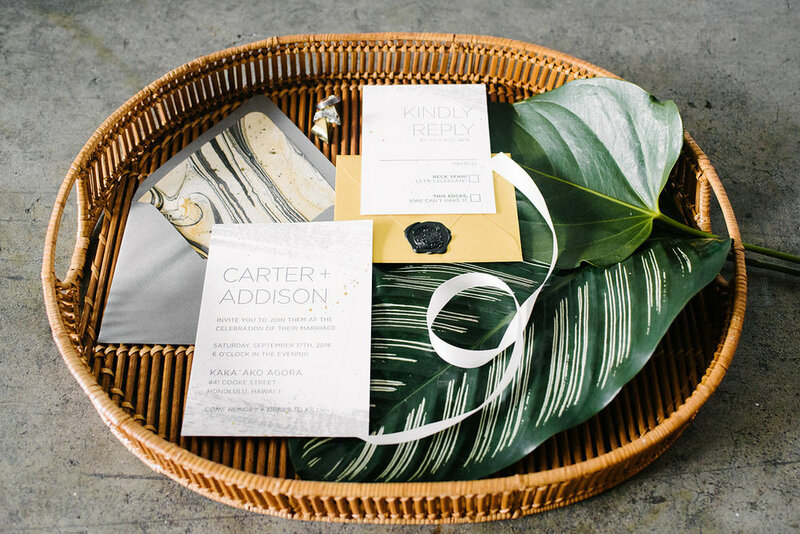 Though simple, the inside of the envelope adds personality with some fun yellow and black marble designs! Whik’d Hair and Makeup took control and ensured that both our bride and groom were picture perfect. Speaking of the bride, she looked absolutely gorgeous in her dress designed by Rue De Seine from Magnolia White Bridal Salon. 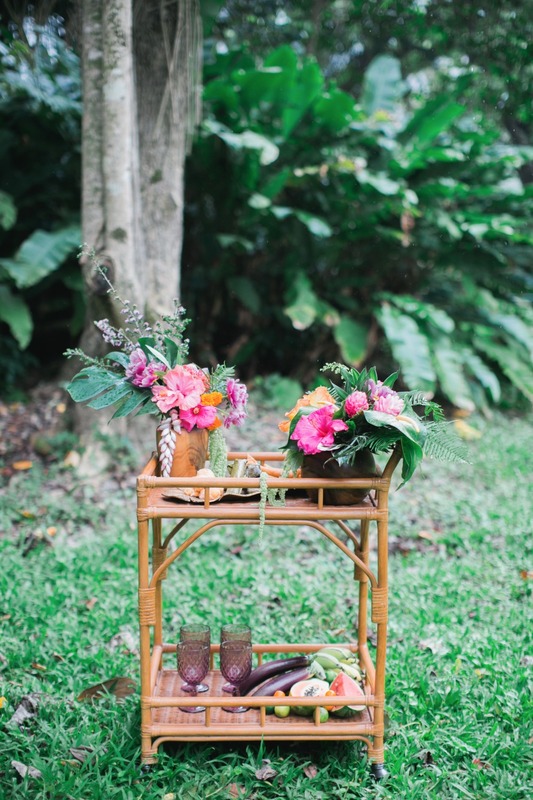 Okika Floral took care of the rest and made everything pretty by adding the vibrant colors of the floral arrangements. 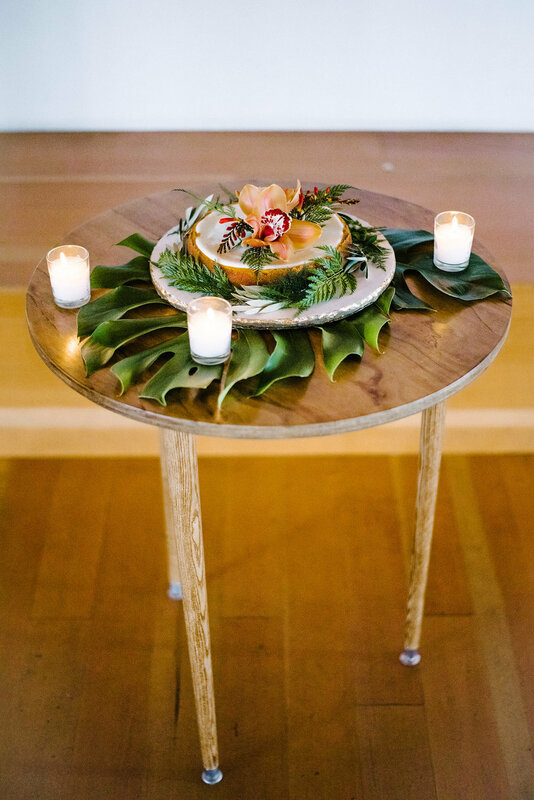 We love how the palm leaves and other foliage frame our peacock chairs; or how the bright orange antheryums and orchids contrast with the simple, yet chic dining setting with copper accent details. And don’t forget about the cake! 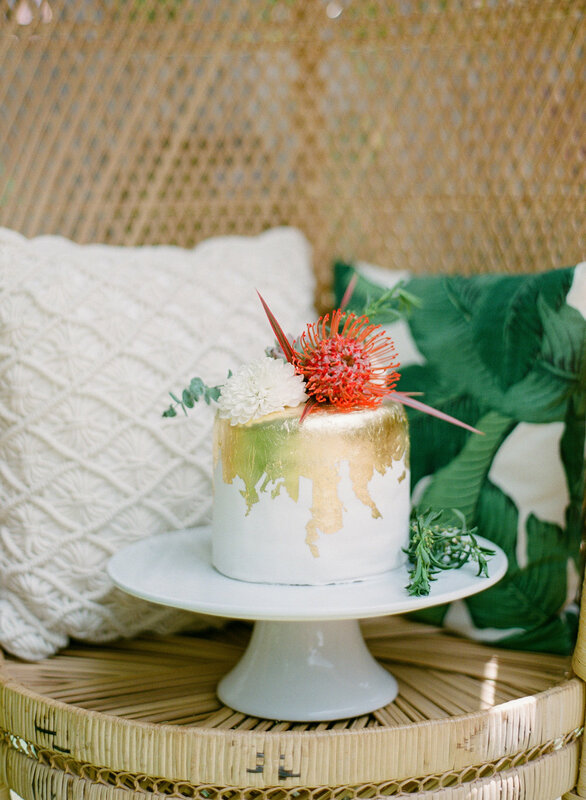 This lovely cake perfectly accentuated our small mid-century cake table. Sometimes less really is more! Although it’s been a hot minute since this photoshoot, we still can’t get over how everything turned out! (We still watch the video often, it just captures the entire vibe so well!). And with 2018 slowly coming to a close, we’re excited for what the new year has in store for us! I don’t know about you, but I’m beginning to think that the term “feeling blue” isn’t such a bad thing after all! Though the origin of the term may not be for certain, we’d like to make it a challenge and redefine what it really means. 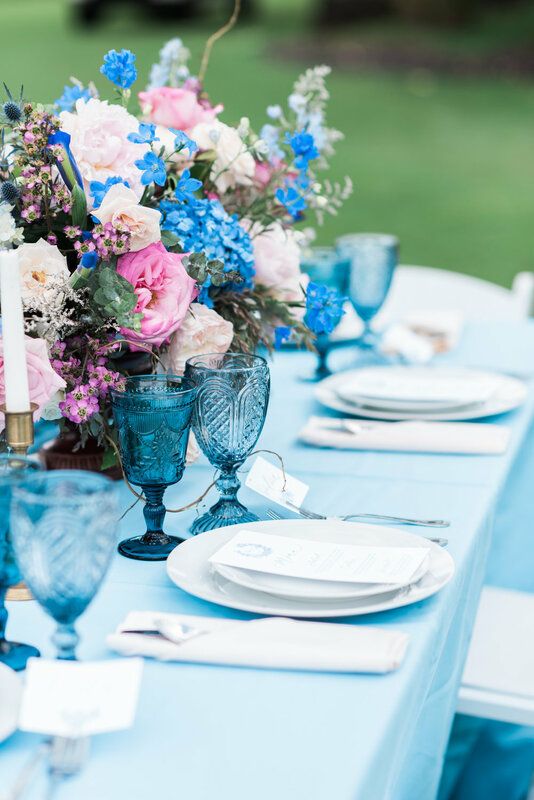 After all, there are so many wonders in this world that are blue—the sky, ocean, sapphires, our wedding photo shoot with Rae Marshall, and the list goes on! 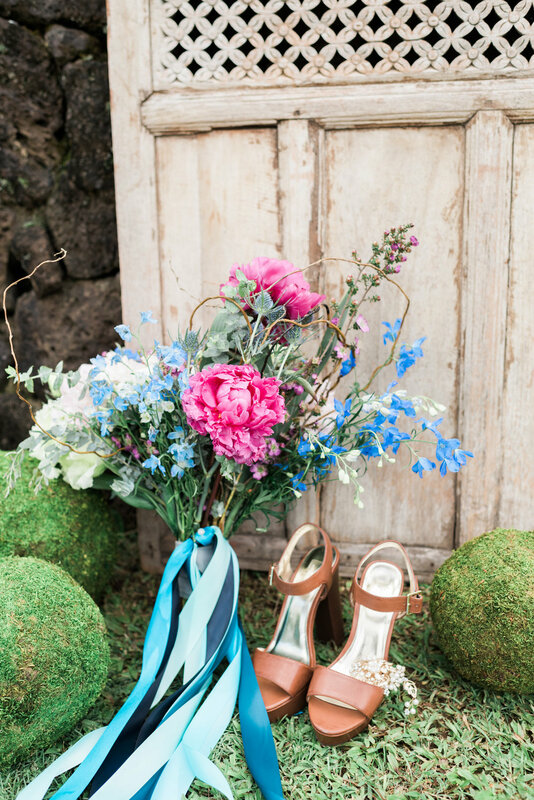 As a matter of fact, not only does the photo shoot at the Royal Hawaiian Golf Course redefine what it means to be blue, it’s also a refreshing twist on your traditional bohemian style. We’re not the only one’s who seem to think so either, we also got featured on Confetti Daydreams! The entire shoot was envisioned and coordinated by Rae Marshall who approached us for a lounge area, making the entire process a breeze! When it comes to your special day you’re definitely going to want to share it with the people you care about. Thus, the importance of invitations! 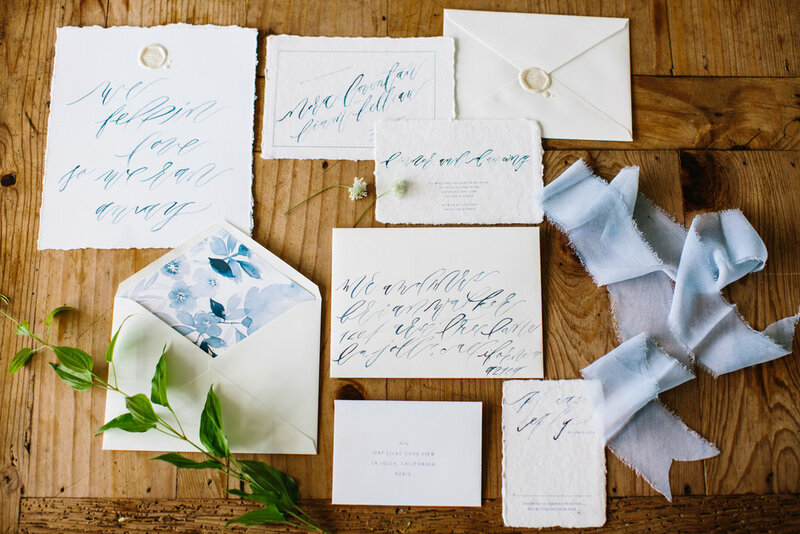 As always, these handwritten invitations are perfectly done by Anna Claire Calligraphy; every stroke is elegantly looped and placed. 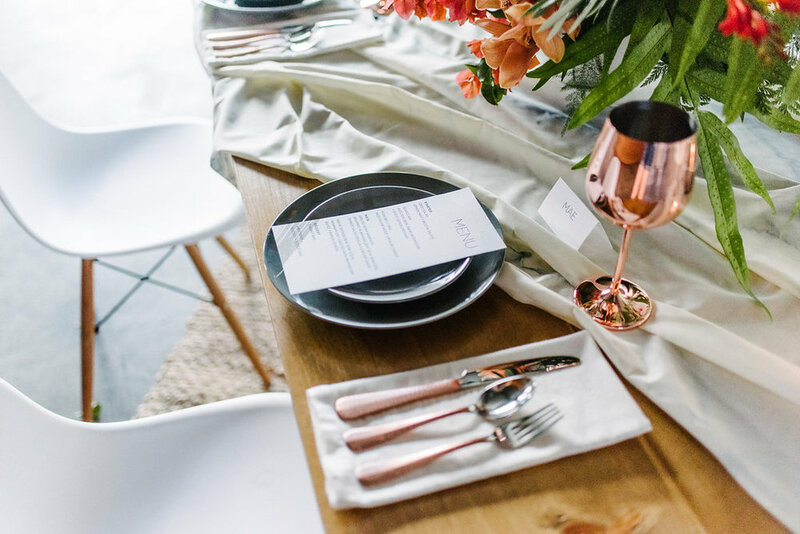 The dining area curated by Accel Event Rentals makes sure that everyone dines in style! Erika from Perfectly Made Hawaii helped make our models look good and feel good. Jeff Alencastre from Concepts by Jeff added a touch of life by incorporating a pop of magenta and pinks into the floral arrangements! We had so much fun designing and creating the outdoor lounge area! Unlike the typical brown peacock chair, we decided to go with all white furniture to keep it classy! It’s the perfect way to enjoy the outdoors and take in the natural beauty of the golf course. Fun fact: our pillows are specially sourced hand-dyed and hand-embroidered batik fabric from Thailand! Being able to find unique new pieces from various places are what make doing what we do so enjoyable! As you can see, being blue doesn’t have to be all that bad! It’s all a matter of perspective and how you decide to add color to the things you do in life! 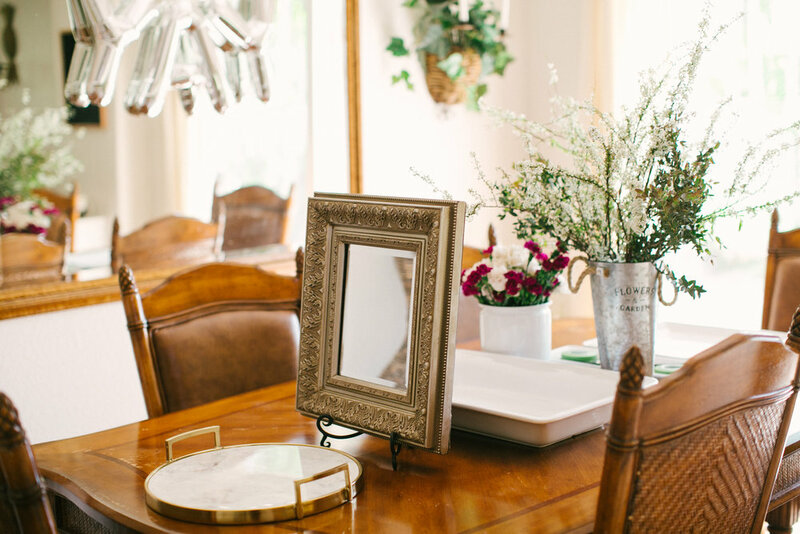 We’re always more than happy to help you find the right furniture and pieces to incorporate a little color into your big day so don’t hesitate to reach out! Happy Friday!